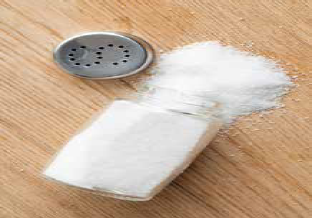 It’s clear that Americans have a taste for salt, but salt plays a role in high blood pressure. Everyone, including kids, should reduce their sodium intake to less than 2,300 milligrams per day (about one teaspoon of salt). Adults age 51 and older, African Americans of any age, and individuals with high blood pressure, diabetes or chronic kidney disease should further reduce their sodium intake to 1,500 mg a day. To help reach that goal, think fresh. Most sodium is found in processed foods. Eat highly processed foods in smaller portions, especially cheesy foods such as pizza; cured meats such as bacon, hot dogs and sausage; and canned stews and soups. Cook at home more often, where you are in control of what’s in your food. Eat a fruit or vegetable at every meal. Cut back on salt little by little, and pay attention to the natural taste of your food. Your taste for salt will lessen over time.